There are not many commercial or industrial coal fired boilers left, but where they exist the load is substantial and the equivalent gas energy usage is measured in the millions of MCF per year. These boilers are typically at least 50,000 lbs of steam per hour (1,000 HP) and larger. They are typically located at very large industrial facilities, paper mills, large food processors and electric power plants. Conversion from coal to 100% natural gas is not likely, unless there is extreme environmental pressure or substantial reductions in loads. Co-firing is a technology that uses gas burners inserted into the boiler in a way that allows both coal and natural gas to be burned at the same time.The main advantages are environmental and load control. Gas burners can be turned up and down very easily and quickly compared to coal, especially, stoker type coal boilers. Gas burners can also be used for pilot burners to start the flame, and for flame stabilization at low load factors. There are two primary types of coal boilers, stoker and pulverized (PC). With a stoker, coal is sized about 2″ chunks and burned on a moving grate on the bottom of the boiler. Pulverizers crush the coal into dust and blow it into the boiler burning the coal dust in suspension. Gas burners are installed above the coal burners in both cases; one or multiple burners can be installed, depending on boiler design and the amount of turn-down control the operator wants. If done for environmental reasons, the amount of gas and coal will be burnt in about the same percentages to keep emissions about the same. This however, is a more difficult control strategy. More often, the coal will be base loaded and the gas burners varied in output to track the load, especially with stoker boilers. Gas firing rates will be typically 5 to 50%. If done for economic reasons, rate will vary with gas price. However, natural gas has never been a cheaper fuel than coal; other variables such as environmental/emissions clean-up equipment, material handling and operational issues must be considered. PC-fired boilers are also classified as either dry bottom or wet bottom, depending on whether the ash is removed in solid or molten state. This is an important differentiation with respect to NOx emissions, as wet-bottom boilers operate at higher furnace temperatures and subsequently emit greater amounts of NOx. Boiler designs in wet- and dry-bottom furnaces hinge on coal quality and ash fusion properties. Wet-bottom furnaces are also referred to as slag tap furnaces. Dry-bottom PC-fired boilers are much more widely used than wet-bottom boilers. 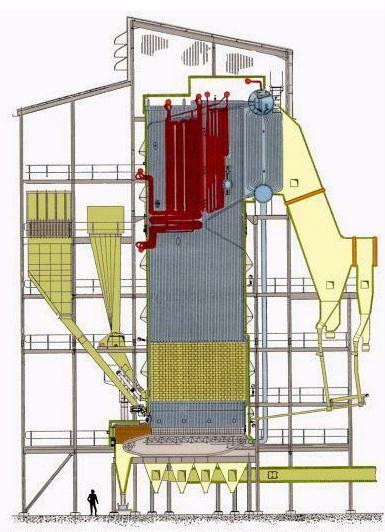 A Variation of the PC Boiler is the Fluidized Bed furnace. Extra air is introduced through the bottom of the fire box so that combustion takes place in suspension, resembling a “fluidized bed” of fire. The main advantage is environmental emissions. After many years of flat coal prices in the range of $50/ton, coal costs have become nearly as unstable as other fuels. Steam cost from coal are highly variable due to handling and storage cost and waste disposal. With coal about $100 per ton, heat rate is about $4.00 per million BTUs, or 1,000 lbs of steam. The larger the system, the lower the coal handling cost per 1,000 lbs of steam. Large operations could add as little as $0.50/1,000 lbs, more typical is about $1.00/1,000 lbs. So $4.50/MCF to $5.00/MCF equivalent. Because natural gas prices are likely to remain above $5.00 per MCF, the most likely reason to convert to natural gas is environmental issues and/or the cost of environmental upgrades that would significantly increase the cost of continuing to burn coal.